Our clients got married on Conan O’Brien! Our clients David & Scott. David and Scott during their ceremony on the Conan O'Brien Show. So on November 3, in the Beacon Theater, Scott & David, were married by Conan himself on the Conan O’Brien Show. After the taping of the show, they headed off to Carmine’s for a gathering of friends and family for dinner and Scott surprised David with his wedding cake from Ron. The cake was three tiers in white fondant with lavender confectionary bands and bows with a bright orange sugar poppy. The flavor was vanilla cake with caramel buttercream. Yummy! 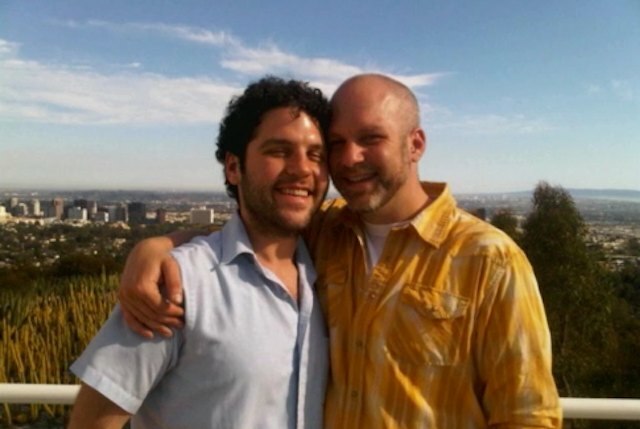 So congrats to Scott and David – may you have a long and happy life together!